Having difficulty growing your hair longer? Can't understand why your hair just doesn't look as healthy or shiny as the woman next to you? Chances are the reason for these hair troubles is simply that your hair keeps breaking off. 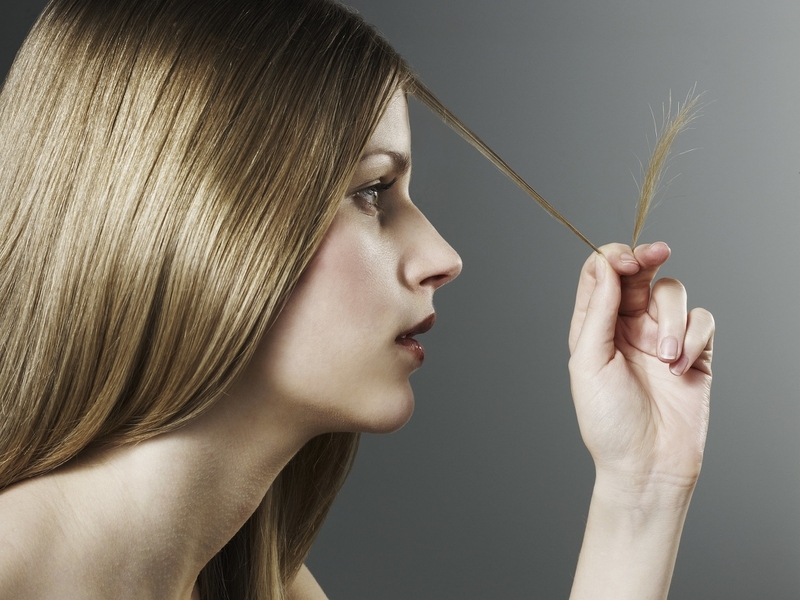 When this occurs, your hair is left weaken and you are left with split ends that prevent the hair from growing. Stopping hair from breaking can be accomplished a number of ways. Read on to learn how. You're trying to grow your hair long, so why would you want to keep scheduling appointments at the hair salon? Trimming the ends of your hair will get rid of the split ends that can damage the whole strand of hair. Regularly trimming your hair will eliminate these split ends and allow your hair to continue to grow. You aren't cutting your hair entirely; just taking off at most a half an inch, which is something you'll want to do about every three months. Wet hair is incredibly vulnerable to damage and brushing your hair when it is wet is sure to cause a lot of damage. Those with black and darker hair need to be especially mindful of this as darker hair tend to already be fragile even when not wet. You want to avoid brushing your hair when it is wet as this will cause the hair to stretch so much that it snaps. You should wait until your hair is at least partially dry before brushing; but you should never use a bristle brush on wet hair; once hair has dried completely, it is fine to use a bristle brush. How to stop hair from breaking using a protein treatment? If you have a serious problem with your hair constantly breaking, you want to consider using a protein strengthening treatment once a week. While this method can effectively help stop your hair from breaking further, it does not mean you will have the healthy hair necessary to keep your hair from breaking in the long term. Be careful when using this method since overdoing this type of treatment can leave the hair drier and more prone to breakage. It can be hard to put down the blow dry, flat iron or curling iron, but all these styling tools can weaken the hair and make it more vulnerable to breakage. While these tools seem to make your life much easier, especially when you are already running late and your hair is still dripping wet, the heat from these tools will cause it to break. Even using these heating tools once a week can cause your hair to be damaged. Use another alternative like magnetic rollers, foam rollers or wet wrap your hair for the same result these tools will leave you with but without the damage. Just like your skin and the rest of your body, your hair needs plenty of moisture to stay healthy. Those with curly hair tend to have drier hair than those with straight hair, which means their hair is more brittle and easier to break. The curls will prevent oils from the scalp reaching the end of the hair that is necessary to keep the hair moisturized. How to stop hair from breaking when you have curly hair then? You want to use a daily moisturizer to keep the hair from drying out. When you go to shampoo your hair, it is recommended you braid your hair beforehand. When you shampoo your hair, it easily gets tangled, making it more difficult to brush and easier to break. Shampooing your hair when it is braided will keep the hair from becoming tangled which will reduce the amount of breakage. While you may think it is the strands of hair you want to focus on keeping clean, it is actually the scalp of your head that you should focus more on. Keeping your scalp healthy is vital when you want your hair to be healthy. Give your scalp the attention it needs by cleansing it at least once every two weeks. The reason your hair may be prone to damage might be because you are over washing it. Many believe that washing the hair every day will keep it clean and healthy, but this will often cause the hair to dry out which, as mention, will cause damage. It is recommended that you wash your hair twice a week and if you need to wash it more than normal, then use a dry shampoo to soak up the excess oil at the roots to keep the hair looking clean. You don't have to buy expensive treatments to keep your hair healthy and promote growth. How to stop hair from breaking then? Use things you already have in your home. Try out these effective home remedies below. Egg treatment - Whip together two eggs, half a cup of full-fat yogurt and a tablespoon of almond oil in a bowl until creamy. Apply the mixture to the scalp and cover with a shower cap. Leave on for an hour and wash out with a mild shampoo and warm water. Repeat this process once a week. Apple cider vinegar - Combine two tablespoons of apple cider vinegar with two cups of water. Wash your hair first with shampoo and conditioner and then pour the apple cider solution over your hair as a final rinse. Repeat this process twice a month. Onion juice - Blend a few onion and extract the juice using cheesecloth, get a fourth a cup of juice. Add one tablespoon of honey to the onion juice and apply the mixture to the scalp and hair. Leave the mixture on your hair covered with a shower cap for half an hour. Rinse the mixture out using a sulfate-free mild shampoo and warm water. Repeat the process once a week.